The Mayo Clinic has proposed a $5 billion investment in Rochester and surrounding communities designed to make the region a "Destination Medical Center" and create up to 45,000 jobs statewide. The plan calls for $3.5 billion in capital investments at its Rochester campus over the next 20 years. Mayo Clinic officials also say they expect an estimated $2.1 billion in additional private investment. "This bold economic development initiative is driven on the proof of growth in the private sector and not the promise of growth," said Mayo Clinic President and CEO John Noseworthy, M.D. 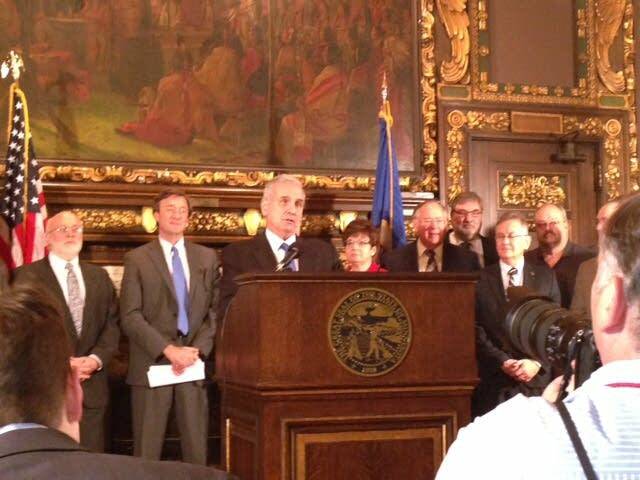 "This will grow the state of Minnesota's economy unlike anything else that we currently have in the state." To support the plan, the clinic is seeking $585 million in public spending to pay for public parking, transportation, transit, utilities, skyways, bridges, public meeting spaces and other improvements. The clinic will ask the state to help finance more than $500 million of that amount by selling bonds to be repaid with personal income, corporate and sales tax revenues generated from the expansion. Gov. Mark Dayton, who appeared with Mayo Clinic officials and southeastern Minnesota lawmakers to announce the plan, called the announcement "an exciting day for Minnesota." He said he expects the Legislature will consider the clinic's request for state funding this legislative session. "I can't stress the importance of this overall," Dayton said. "I don't know if this is exactly the right financing mechanism." Rochester Mayor Ardell Brede, however, praised the proposal, noting similar investments by other states. "This is huge," Brede said. "But we also are aware that places like the Cleveland Clinic, like Johns Hopkins, their states have invested $500 million, $600 million to their medical institutions. And that's the competition we can be facing." Brede brushed off criticism from some state leaders who say Rochester and Olmsted need to contribute more public funds. He said as Rochester grows, he expects the city will be in a position to finance more than its $20 million share of the project. Last year, Rochester voters approved an extension of the local sales tax that included $20 million as an additional city contribution to support the development initiative. "As the city grows and the tax base grows because there's more people working here, more people spending money here and taxes coming from business, that will help pay the infrastructure certainly that's needed," Brede said. • Rochester will finance a portion of the proposed $585 million using city tax revenues and other financing tools. • A new public body will review multi-year public development plans in the Destination Medical Center special services district and recommend eligible public infrastructure projects to the state for financing. • The state portion of more than $500 in project financing would be secured by a bond that is drawn upon over the 20 years when eligible projects are needed and then submitted to the state for final approval. • The bonds would be repaid using a small percentage of the new state tax revenues generated by the Mayo Clinic and expansion in Rochester as the bond revenue stream. • The Destination Medical Center financing proposal relies on proof of new tax growth paid to the state before additional projects are financed. 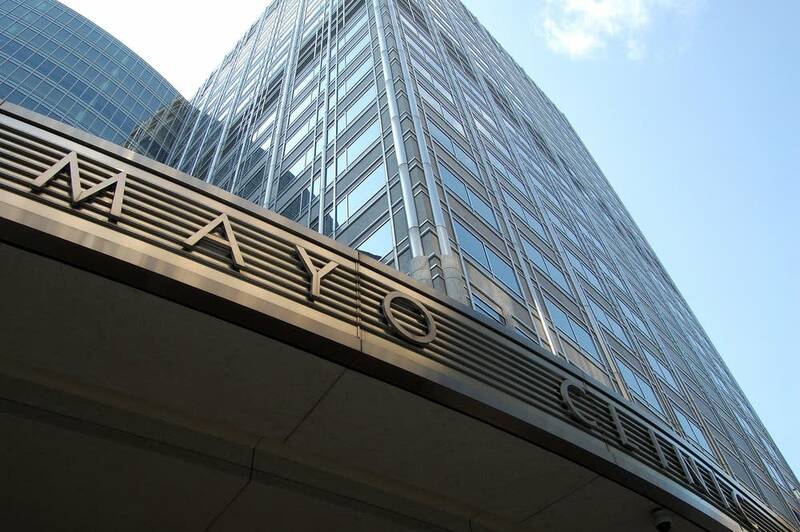 Mayo Clinic is Minnesota's largest private employer with 32,000 employees in the state. It projects the plan would create between 35,000 and 45,000 new jobs in Rochester and Minnesota. The "Destination Medical Center" is aimed at building on the Mayo Clinic's status as a leader in health care. People from around the world visit the Rochester facility for medical care. Mayo Clinic officials say they've been working on the proposal for three years and are now asking the state of Minnesota to redirect existing state and local tax money to help finance the project. The health care facility plans to privately finance its facilities expansion, but requests state help financing improvements to transportation facilities, parking and other key elements. The proposal requests that existing and future tax revenues from the city of Rochester and Minnesota help finance the project. The clinic has been approached by other U.S. cities and foreign countries to consider expansions outside of Minnesota, and will consider expanding outside Minnesota in future years, Noseworthy said. "We believe Rochester can and should remain Mayo's global headquarters and a premier destination for medical care well into the future," he said, "assuming we can attract the additional private business investments and finance the necessary public infrastructure needed to support an expansion of this scale." The plan already has the support of Rochester-area legislators. "We're very interested in making sure that we continue to have high quality international leading health care," said state Sen. Carla Nelson, R-Rochester. "We want this to continue to be a state where people from other states and counties come to get that high quality health care." Nelson characterized Mayo Clinic's proposal as an "innovative economic development tool." But such proposals have been criticized by state lawmakers in the past because they would divert existing tax revenues for schools and other programs to private development. The chairs of the House and Senate Tax Committees likely will hold hearings on the plan. "The Mayo Clinic, that we hold in high esteem in the state, is considering investing in the state and we like that," said Rep. Ann Lenczewski, DFL-Bloomington. "But we have to make sure the taxpayers are getting a good deal." Lenczewski, who chairs the House Taxes Committee, said lawmakers been working to eliminate tax exemptions and specialized carve outs from the tax code, but she hopes lawmakers can come up with a plan that will be acceptable to the Mayo Clinic and the Legislature. Other legislators said they think the Legislature should do whatever it can to ensure Mayo's promised investment is fulfilled. "They're looking at adding tens of thousands of new jobs," said Rep. Greg Davids, R-Preston. "If the state can help them through tax policy we certainly want to do that." Reporters contributing to this story are Madeleine Baran in St. Paul and Elizabeth Baier in Rochester.